Over 50 years of global isolation prior to Myanmar’s democratic transition has left the country with many challenging legacies regarding government transparency and human rights. However, since 2011 the government has experienced rapid changes and undertaken significant reforms of its public financial management (PFM) in pursuit of robust democratic systems. IBP has long argued that open and accountable public budgeting is at the center of democratic practice and equity, and that it is the first place we should look for ways to strengthen the interaction between governments and citizens. But it is often difficult to translate jargon heavy budget documents into forms that people can understand and respond to. Spectrum (Sustainable Development Knowledge Network) was founded in 2007, during the early phase of Myanmar’s democratic transition. A local research, policy, and communications group Spectrum focuses on Resources, Rights and Economic Justice. Spectrum’s Economic Justice work prioritizes: revenue transparency, budget transparency, anti-corruption, tax reform, procurement reform, social accountability, and financial literacy. These components comprise the huge complexity of areas in need of reform in Myanmar. Effectively communicating the different aspects of economic justice while also making public finance information more accessible have been key goals of the organization. One strategy Spectrum has piloted with great results is the use of cartooning in explaining complex topics like responsible resource use and revenue transparency to the public. Cartoons have long been used in Myanmar to ignite discussion on political issues, as their illustrative quality can be more easily understood by those with limited literacy or little technical expertise. Spectrum’s use of cartoons to simplify complex issues around government transparency and accountability has been quite successful. The organization participated in a number of cartoon exhibitions and began producing pieces such as a cartoon representation of the 2013 Extractive Industries Transparency Initiative (EITI) Standard, helping to boost Myanmar’s progress in the EITI candidacy process. More recently, Spectrum has moved to using cartooning to explore themes of budget transparency and financial accountability. 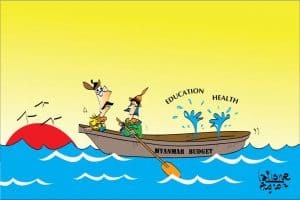 Translating these complex topics to the general populace can be challenging, but the use of art and cartoons help citizens to better understand complex and sensitive messages around the budget. Spectrum’s cartoons often take one of two forms: 1) a presentation of information directly related to the budget concepts (often including infographics), or, 2) an interpretation of public perceptions in a democracy whereby transparency and public participation are still evolving. The cartoons are a mix of concepts for which illustrations were sought: impressions from cartoonist interactions with public and of cartoonists own interpretations of the context guided the work. Spectrum recently organized an exhibition with 160 parliamentarians and decision makers titled “Budget Transparency for Improving People’s Lives,” featuring the works of 40 cartoonists. The cartoons on display, a mix of hand and computer drawings, covered a range of budget transparency and accountability topics, including the importance of transparency in state finances, taxation, and the management of natural resources. The exhibition also included cartoon books that Spectrum published as part of its awareness campaigns over the past decade and was accompanied by the release of Spectrum’s Budget Guide for Decision Makers. 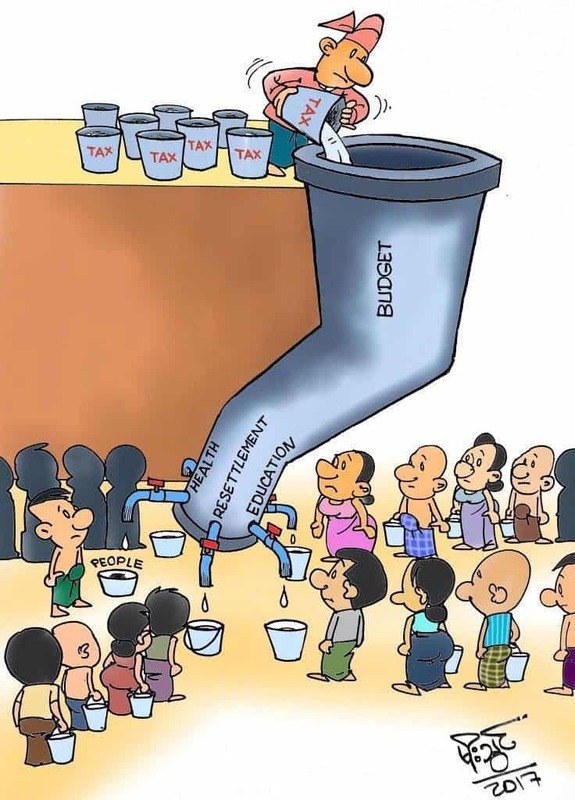 Spectrum’s cartooning has also had impact on Myanmar’s performance on the transparency assessment of the Open Budget Survey – the International Budget Partnership’s biennial assessment of budget transparency, participation, and oversight in countries around the world. Spectrum worked with Ministry of Planning and Finance (MOPF) and United Kingdom Department for International Development (DFID) to assist MOPF to create Myanmar’s first Citizens’ Budget, a document that has been republished twice more since its inception (see the latest version here). Working on the Citizens Budgets helped build cooperation with the Ministry of Planning and Finance, which went on to make a huge amount of additional budget information available to the public, particularly in 2017. This is partly reflected in the increase in Myanmar’s Open Budget Index 2017 score over its 2015 score, the last round of the survey. While this improvement deserves recognition, the government still has a long way to go in order to meet sufficient levels of budget transparency. misallocation of funds, effectiveness of taxation mechanisms, and corruption issues. By communicating public priorities and concerns, the cartoons offer insight for government strategy and national development processes. For parliamentarians, they can increase understanding about the needs of their constituencies. And for the public, the cartoonists offered ordinary people a means of communicating their spending priorities to the government in an accessible fashion. The importance of this last benefit cannot be overstated. Citizens deserve a voice in government decision making on how public money is spent and many struggle to participate in more formal mechanisms for public engagement. 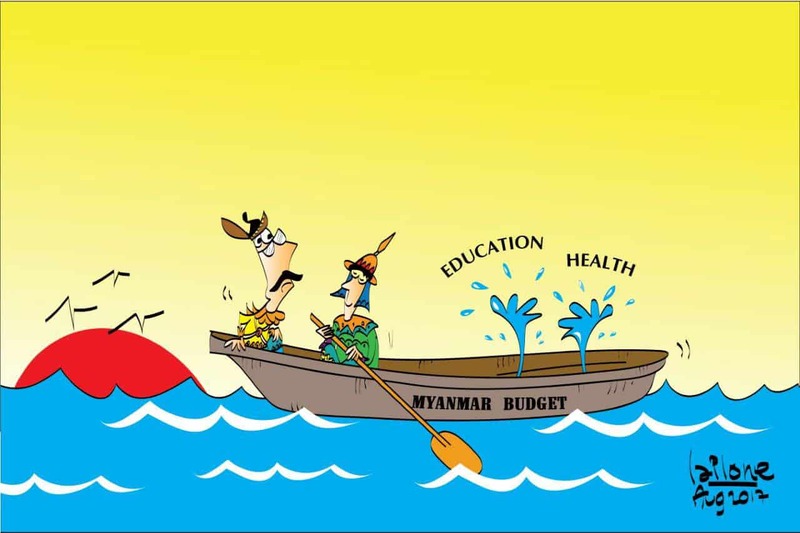 These impact images are hitting the mark in Myanmar, and Spectrum will keep exploring cartoons for change as a way to bring more people into budget processes.